Solid, SAFE, "lead free" pewter! Comes READY TO WEAR out of pkg with FREE 30" nylon cord! 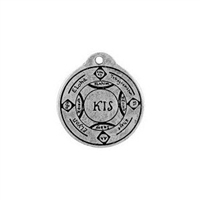 *****PLEASE view our other items for more OCCULT pendants some of which you can't get ANYWHERE else in the WORLD! HERE'S THE DEAL: The names on this pendant are supposedly, allegedly of POWERFUL ANGELS that for some reason or another were expelled from heaven BUT ARE STILL GOOD and ready to come to the aid of those who would call on them. This pendant is made from ancient magical inscriptions of VERY powerful spirit names. These are the names of very powerful yet very GOOD spirits. It is believed by many through the ages that by wearing this pendant, these spirits will watch over the wearer and intercede on his or her behalf bringing GOOD LUCK, MONEY, LOVE and all the other GOOD THINGS in life! This symbol has always been very hard to come by, and those lucky enough to come into possession of one were REALLY AND TRULY LUCKY to have one!! I have obtained a limited number of these shocking pendants to offer to the public (in some places, for the first time EVER) for a very, very affordable price. I want you to be able to take advantage of this pendant right away, so I am also giving you a high-quality FREE 30 INCH NECK CORD, so your pendant arrives ready to slip right around your neck and WEAR IMMEDIATELY!!!! You can try this magical pendant out absolutely RISK FREE - When it arrives, simply slip it around your neck. If it isn't everything you hoped it would be, simply send it back for a cheerful "no questions asked" refund. Unconditionally guaranteed, if you don't love it, just send it back for a full refund, no questions asked! Available RIGHT NOW on AMAZON.COM from authorized AMAZON seller SOLAR-VISION. "HURRY, SUPPLIES ARE LIMITED!" Made from SOLID, safe, LEAD FREE pewter!! ***ALSO PLEASE SEE OUR OTHER ITEMS for some rare stuff you can't get ANYWHERE else! 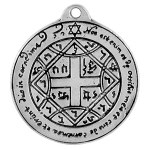 The seal on this pendant is the famed CIRCLE OF SOLOMON allegedly used by King Solomon from the Bible to control all things. 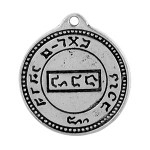 Inscribed on this pendant are the magical names of God. It is believed by many through the ages that by wearing this pendant the wearer would receive PROTECTION, GOOD LUCK, MONEY, LOVE and all the other GOOD THINGS in life, as well as control the very FORCES OF NATURE ITSELF! This symbol has always been very hard to come by, and those lucky enough to come into possession of one were REALLY AND TRULY LUCKY to have one!! I have obtained a limited number of these shocking pendants to offer to the public (in some places, for the first time EVER) for a very, very affordable price. I want you to be able to take advantage of this pendant right away, so I am also giving you a high-quality FREE 30 INCH NECK CORD, so your pendant arrives ready to slip right around your neck and WEAR IMMEDIATELY!!!! You can try this magical pendant out absolutely RISK FREE - When it arrives, simply slip it around your neck. If it isn't everything you hoped it would be, simply send it back for a cheerful "no questions asked" refund. Unconditionally guaranteed, if you don't love it, just send it back for a full refund, no questions asked! Available NOW on AMAZON.COM from authorized AMAZON seller SOLAR-VISION. "HURRY, SUPPLIES ARE LIMITED!" Made from SOLID, safe, LEAD FREE pewter !! Comes "READY TO WEAR" out of package w/ FREE 30" neck cord! (***PLEASE view our other items for more MAGICAL pendants - some of which you cannot find ANYWHERE ELSE in the world!!! ***) - The legendary ancient inscriptions on this pendant have long been looked upon by many as having "magical powers" to protect the wearer against enemies. Legend has it that the wearer of this seal not only cannot be physically harmed by enemies, but if he or she is attacked, that the weapons will be TURNED BACK on the attacker!! This seal, by popular apocryphal belief was USED BY MOSES to protect against attackers. Viewed by many as very, very POWERFUL magic! No such claims can be made here, but this MUST be everything you hope or return for full refund. NOW, you can have one of these amulets of your VERY OWN at a very, very inexpensive price! This is the REAL THING, accept NO imitations! Comes with a FREE 30 inch neck cord, so this beautiful peace comes "READY TO WEAR" and start enjoying right away!! EASY TO USE, no special instructions needed: simply slip this around your neck when you receive your package and go about your day as normal. I GUARANTEE this amazing amulet will be everything you expect it to be! You MUST BE DELIGHTED OR RETURN FOR A PROMPT, FULL REFUND!! This highest quality pendant is available RIGHT NOW on AMAZON.COM from authorized AMAZON seller SOLAR-VISION. SUPPLIES ARE STRICTLY LIMITED, SO PLEASE ORDER TODAY!! Made from SOLID, SAFE, "LEAD FREE" pewter! Made to last a lifetime! **Visit our store for MORE occult jewelry - some that you cannot find ANYWHERE else in the world!! ** The legendary, ancient symbol on this pendant is long believed to allow the wearer to avert accidents, as well as protect the wearer from NUMEROUS "outside forces". This is worn by people who travel, people on vacation, those having to commute on a day to day basis, people who take plane flights, train trips, bus trips as well as skydiving, parasailing, bungee jumping, or when venturing into bad neighborhoods or unfamiliar territories. This is viewed by many as very very STRONG magic. I have obtained a limited number of these shocking pendants to offer to the public (in some places, for the first time EVER) for a very, very affordable price. I want you to be able to take advantage of this pendant right away, so I am also giving you a high-quality FREE 30 INCH NECK CORD, so your pendant arrives ready to slip right around your neck and WEAR IMMEDIATELY!!!! You can try this magical pendant out absolutely RISK FREE - When it arrives, simply slip it around your neck. If it isn't everything you hoped it would be, simply send it back for a cheerful "no questions asked" refund. Unconditionally guaranteed, if you don't love it, just send it back for a full refund, no questions asked! This pendant is available RIGHT NOW from authorized AMAZON seller SOLAR-VISION. "HURRY, SUPPLIES ARE LIMITED!" GOOD FORTUNE Money Luck pendant !! Comes ready to wear & use with 30" neck cord! The ancient, MYSTICAL symbols on this talisman were purportedly created by the legendary ancient sorcerer Arabatel for the purpose of bringing GOOD FORTUNE, GOOD LUCK and UNTOLD RICHES AND WEALTH to the one who wears this powerful symbol around their neck. Precise, ancient Hebrew magical symbols appear on one side, while its back is that of a pentagram surrounded by yet more evocative, mystical symbols. Become one of the "lucky few" people who, throughout history have taken advantage of this POWERFUL magical MONEY amulet. 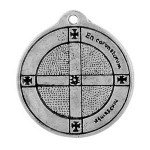 NOW, you can have one of these amulets of your VERY OWN at a very, very inexpensive price! This is the REAL THING, accept NO imitations! Comes with a FREE 30 inch neck cord, so this beautiful peace comes "READY TO WEAR" and start enjoying right away!! EASY TO USE, no special instructions needed: simply slip this around your neck when you receive your package and go about your day as normal. I GUARANTEE this amazing amulet will be everything you expect it to be! You MUST BE DELIGHTED OR RETURN FOR A PROMPT, FULL REFUND!! This VERY HIGH QUALITY pendant is available NOW on AMAZON.COM from authorized AMAZON seller SOLAR-VISION. SUPPLIES ARE STRICTLY LIMITED, SO PLEASE ORDER TODAY!! Solid (NOT plated! ), SAFE lead-free pewter!!! FREE 30" neck cord - READY TO WEAR!! This ancient magical seal was designed for the purpose of giving the owner a good memory. 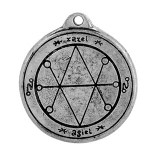 However, In recent times, this seal has also been used by people who want to enhance their mind power and gain psychic abilities for the purpose of going into business as a professional psychic. It is for this reason that this seal has become a favorite among those who are trying to develop powers of the mind, esp, psychic abilities, and learning how to read and memorize the tarot deck. This symbol has always been very hard to come by, and those lucky enough to come into possession of one were REALLY AND TRULY LUCKY to have one!! I have obtained a limited number of these shocking pendants to offer to the public (in some places, for the first time EVER) for a very, very affordable price. I want you to be able to take advantage of this pendant right away, so I am also giving you a high-quality FREE 30 INCH NECK CORD, so your pendant arrives ready to slip right around your neck and WEAR IMMEDIATELY!!!! You can try this magical pendant out absolutely RISK FREE - When it arrives, simply slip it around your neck. If it isn't everything you hoped it would be, simply send it back for a cheerful "no questions asked" refund. Unconditionally guaranteed, if you don't love it, just send it back for a full refund, no questions asked! This VERY HIGH QUALITY pendant is available NOW on AMAZON.COM from authorized AMAZON seller SOLAR-VISION. "HURRY, SUPPLIES ARE LIMITED!" SOLID (not plated), SAFE, "LEAD FREE" pewter! READY TO WEAR Comes with FREE 30" neck cord!! As seen and mentioned in the book "MAGICK SPELLS FOR LOVE, LUST AND ROMANCE"!) 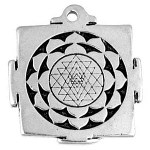 This pendant is a sri yantra symbol designed SPECIFICALLY to invoke the favor and blessing of LALITA, the great Goddess of LUST, LOVE and ROMANCE! Made of SOLID, high quality "lead free" pewter and TRULY designed to last for a LIFETIME, you will cherish this piece and pass it on from generation to generation. Comes with a FREE 30 inch nylon neck cord - COMPLETE AND READY TO WEAR!! Slip this powerful amulet steeped in thousands of years of tradition over your neck and feel the electricity and excitement of having taken an important step! COMPLETE "SECRET INSTRUCTIONS FOR USE" included. You MUST BE DELIGHTED OR RETURN FOR A PROMPT, FULL REFUND!! This VERY HIGH QUALITY pendant is available NOW on AMAZON.COM from authorized AMAZON seller SOLAR-VISION. SUPPLIES ARE STRICTLY LIMITED, SO PLEASE ORDER TODAY!! DOUBLE SIDED, made of 100% SAFE, "LEAD FREE" pewter! Comes with a FREE 30" nylon cord designed to last FOREVER! The "Seals of Solomon" in popular religious belief were a set of "seals" revealed to Solomon the King. It was these seals which gave King Solomon his "unearthly magical powers". 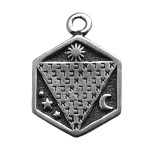 The above pendant is the famed ancient SEAL OF SOLOMON called the "4th pentacle of Venus". In popular legend, this magical seal would give the possessor the power to cause any person they desire to come to him or her! This seal is cast in SOLID, HIGH QUALITY "LEAD FREE" PEWTER and is designed to last a LIFETIME! Comes with a free 30 inch nylon neck cord, ALSO designed to last an entire lifetime! 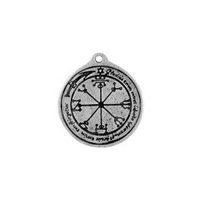 Slip this powerful talisman around your neck, feel the legendary power and see what happens! Unconditionally guaranteed, if you don't love it, just send it back for a full refund, no questions asked!